The summer sun poses problems for everyone, from vampires (incineration), to regular dudes who've made the wise decision to seasonally buzz their head (sunburned scalp). Handle the latter situation with AXE's new Buzzed Look Cream + SPF 15, which helps protect domes without leaving greasy/oily residue -- then without worrying about harmful rays, hit these prime outdoor spots to Enjoy Your Buzz. This stellar lineup runs from a swank surf shop to a Culver City beer lounge that professes to be sublime, mainly because they too, don't practice Santeria. 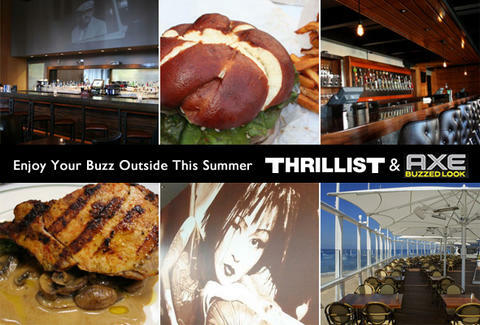 This how-have-I-lived-my-life-without-knowing-about-these-places guide also gives you the deets on a bevy of outdoor eateries, from a Napa-inspired Westwood resto to a Century City joint slanging Underground Burgers, which definitely have beef with major-label burgers, but will sell out for twice the bread. Apply this miraculous, mess-free cream to your noggin, then check out AXE Buzzed and Thrillist's Outdoor Summer Reco's on this HQ to enjoy a true vampire weekend -- minus the annoying xylophones. *Avoid overexposure to the sun. Apply on scalp as directed. Wear protective clothing.